We have got six-quarter finalist as Poland, Wales, Portugal, France, Germany, and Belgium all defeated their opponents to move on to the next rounds. Two matches remain in this stage with one being this and the other one between England and Iceland later today. 27th June 2016 at 21:30 (IST). Spain has the third best pass completion in this tournament till now with a rate of 93% rate as they completed 1876 out of the 2023 passes with an average possession of 66% and an accuracy of 90%. They have scored five goals in the three matches till now out of the 36 shots they have had on the goal with an accuracy of 38%. Alvaro Morata is their top scorer with three goals in the three matches played till now, Nolito and Pique have scored one each. Spain has been a very strong team and after their disastrous run in the World Cup 2014, they have a lot to prove. They have had a lot of possession in every game, and they have dominated the opposition in every game till now, but yet they lost against Croatia in their last game in the group stage. They still need to improve a lot if they want to beat Italy. Spain won against Turkey by 3-0 and against the Czech Republic by 1-0 and lost to Croatia by 2-1 in the group stage. 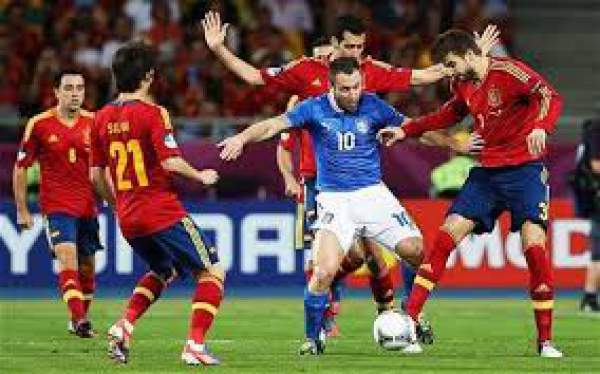 These teams have played a total of 34 times against each other in which Italy have won 10, Spain 12 and 12 were drawn. They met in the Euro 2012 finals in which Spain beat them by 4-0, and I am sure Italy would remember that and would want to take revenge of that match. Italy has been very disciplined in this tournament and as a result, they are in the knockout stages and can go even further in the tournament. They have a pass completion rate of 82%, scored three goals out of the 20 shots with an accuracy of 50%. De Gea, Juanfran, Pique, Ramos, Alba, Fabregas, Busquets, Iniesta, Silva, Morata, Nolito. Sirigu, Barzagli, Bonucci, Ogbonna, Bernardeschi, Sturaro, Motta, Florenzi, De Sciglio, Zaza, Immobile. ITA vs SPA Euro 2016 round of 16 match is set to start at 6 p.m. local time (9.30 p.m. IST, 5 p.m. BST, 12 p.m. ET). Italy: TV: Rai Uno and Sky Sport Italia 1. Live Stream: Sky Italia Go.